Amity drivers looking for the 2013 Honda CR-V should visit Middletown Honda. While there is tight competition in the crossover and SUV markets these days, Honda continues to improve upon their high standards, including the 2013 Honda CR-V. With competitive pricing, strong fuel economy ratings and smart standard features that owners expect, this most recent addition of this SUV is sure to please. Come see this new model at Middletown Honda, located at 520 Route 211 East in Middletown. If you’ve been considering some rivals to the Honda, here are some important facts to mull over when comparing the 2013 CR-V LX with the Toyota RAV4 Base model. Smart buyers always consider the bottom line first, and even though the most recent edition of Honda’s popular crossover and the latest RAV4 are priced within less than $100 of one another’s MSRPs, Honda comes out ahead, offering more features and value for the price. Both of these vehicles feature 4-cylinder engines coupled to automatic transmissions. The CR-V LX sports a 2.4L I-4 engine that produces 185 hp, while the RAV4 has a 2.5L I-4 engine making only 179 hp, setting the Honda ahead for power. 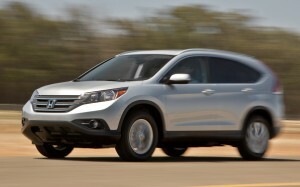 Honda also takes the lead on efficiency, thanks to the CR-V’s impressive fuel economy. According to EPA estimates, 2WD models of the CR-V return 23 mpg in the city, 31 mpg on the highway, and 26 mpg combined. * The RAV4, on the other hand gets 22 mpg city, 28 mpg highway, and 24 mpg combined. The Honda pulls ahead in all three categories, which translates into savings at the gas pump, especially over the life of the vehicle. Middletown Honda is proud to feature the popular lineup of the CR-V at our showroom. Come speak to one of our sales professionals about its excellent standard features, like a rearview camera and tailgate power locks, at our dealership today. You can also “like” our Facebook page to find out about special sales events and inventory updates.